We have a few areas in the gardens here at The Vyne where the plants change each year. For example, areas of summer bedding and a section of our Glasshouse. It’s fun and interesting to try something different each time, so this year we have gone with an American theme. In the Summerhouse garden we are growing Fuchsias and Dahlias with Ipomea growing up (admittedly European) hazel frames. We’ve had concerns about the Angelonia – [Summer snapdragon], a slightly less common bedding plant. They weren’t happy, perhaps because of a cold spell of weather, but they seem to have recovered. One of our volunteers, Neil Smith, has been overseeing great things in the Glasshouse with another display of American plants: Abutilon – [Flowering Maple], various Begonias, Mimulus – [Monkey flowers] and Mexican orchids. In the vegetable beds Thrive have been experimenting with the ‘three sisters’ technique; apparently used by native Americans, its a rather interesting mix of beans climbing the sweetcorn with pumpkins or squash acting as a living mulch across the ground beneath. Does much of the current planting in the garden reflect the house’s Tudor origin? The Times newspaper did a piece a while back on Tudor gardens. There is no Tudor planting currently reflecting the Tudor origins of the House. This is because the Tudor garden (and, incidentally, much of the House) was swept away in the 18th Century to make way for a more fashionable ‘landscape garden’ – much of which does still exist today. Many of the NT gardens you will visit today are similar, where decisions have been taken on which historical layers of the garden to keep – and often it is felt that it is better to keep the layers that still exist (and the 18th century landscapes are wonderfully low maintenance and therefore often still do exist) rather than try to recreate other layers for which there is often little or no evidence. 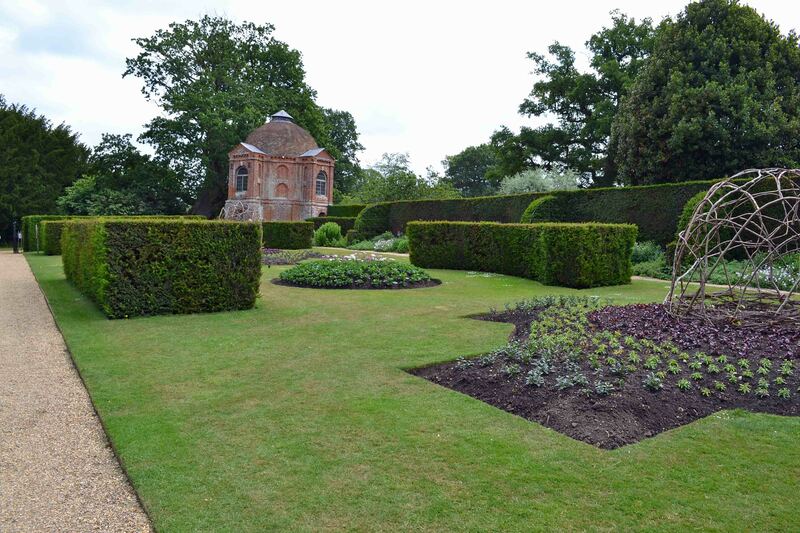 However never say never – and who knows perhaps one day we will have a Tudor garden back at The Vyne.